Granger Girls Soccer 0, La Salle 8 at Granger on Thursday, October 18th. Granger had 13 saves. First Half: Kamryn Fiscus (LS) (Peyton McCrea) 15:00, Kamryn Fiscus (LS) 16:00, Gillian Martin (LS) 25:00, Elle Lancaster (LS) (Lauren Desmerais) 28:00, Gillian Martin (LS) (Kamryn Fiscus) 29:00, Lauren Desmerais (LS) (Kamryn Fiscus) 36:00. Second Half: Lauren Desmerais (LS) 60:00, Natalie Newman (LS) (Lilly Siegler) 63:00. Saves: Hayley Stohr (LS) 0, Granger 13. Spartan Girls Soccer lost 1-0 at Naches Valley on Tuesday, October 16th. First Half: Faith Hahn-Landis (NV) (Katherine Cartmel) 34:00. Saves: Tanara Zieback (NV) 2, Granger 10. Granger Girls Soccer lost at home to Highland 3-0 on Thursday, October 11th. Pricila Ramos had 6 saves for the Spartans. First Half: Gaby Gutierrez (H) (Jackie Naranjo) 7:00, Gaby Gutierrez (H) 9:00. Second Half: Jackie Naranjo (H) (Fatima Lopez) 54:00. 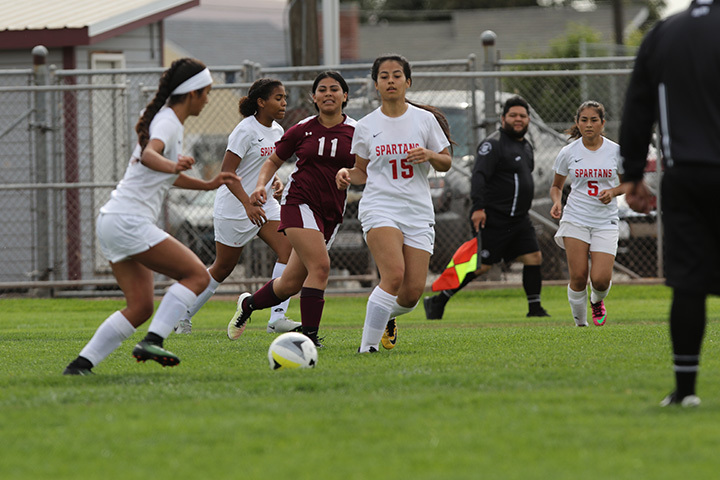 Spartan Girls Soccer lost at Goldendale 3-1 on Monday, October 8th. 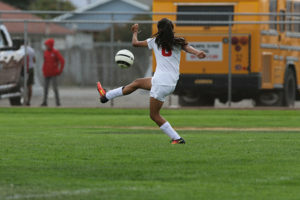 Mireya Carrasco scored Granger’s goal with a Yaneli Torres assist. Priscila Ramos had 11 saves. Saves: Priscila Ramos (G) 11, Jeeneeva Lawrence (Go) 8. Spartan Girls Soccer 2, Zillah 0 in Granger on Thursday, October 4th. Xochitl scored two penalty kicks in the second half to lead Granger. Second Half: Xochitl Chavez (G) PK 66:00, Xochitl Chavez (G) PK 71:oo. Saves: Priscila Ramos (G) 3, Zillah 7. Granger Spartan Girls Soccer defeated Ki-Be at home on Tuesday, October 2nd. Tobi Guisinger scored the tying goal and Mireya Carrasco scored the go ahead goal for Granger in the first half. First Half: Ariel Lofton (KB) 9:00, Liliana Luna (G) 9:00, Ariel Lofton (KB) 17:00, Tobi Guisinger (G) 21:00, Mireya Carrasco (G) (Julie Salgado) 24:00, Xochitl Chavez (G) 32:00. Second Half: Ariel Lofton (KB) 56:00. Saves: Priscila Ramos (G) 5, Ki-Be 4. Granger Spartan Girls Soccer lost 4-2 at home vs Cle Elum on Thursday, September 27th. Brenda Cuevas and Mireya Carrasco each scored for the Spartans. Priscila Ramos had 9 saves. First Half: Grace Terrill (CE) 23:00. Second Half: Grace Jackson (CE) (Penalty Kick) 55:00, Grace Terrill (CE) 60:00, Grace Terrill (CE) 67:00, Brenda Cuevas (G) 70:00, Mireya Carrasco (G) (Yaneli Torres) 78:00. Granger Girls’ Soccer lost at La Salle 11-0 to La Salle on Tuesday, September 25th. Priscila Ramos had 15 saves for the Spartans. First Half: Gillian Martin (L) 1:00, Lauren Desmarais (L) (Peyton McCrea) 6:00, Elle Lancaster (L) (Lily Lancaster) 23:00, Ellie Richardson (L) 37:00. Second Half: Kamryn Fiscus (L) (Azul Ponce) 52:00, Gillian Martin (L) (Kamryn Fiscus) 59:00, Tatiana White (L) (Natalie Newman) 63:00, Gillian Martin (L) (Kamryn Fiscus) 67:00, Kamryn Fiscus (L) (Tatiana White) 71:00, Grace Liscano (L) 77:00, Peyton McCrea (L) (Kamryn Fiscus) 80:00. Saves: Hayley Stohr (L) 0, Priscila Ramos (G) 15. 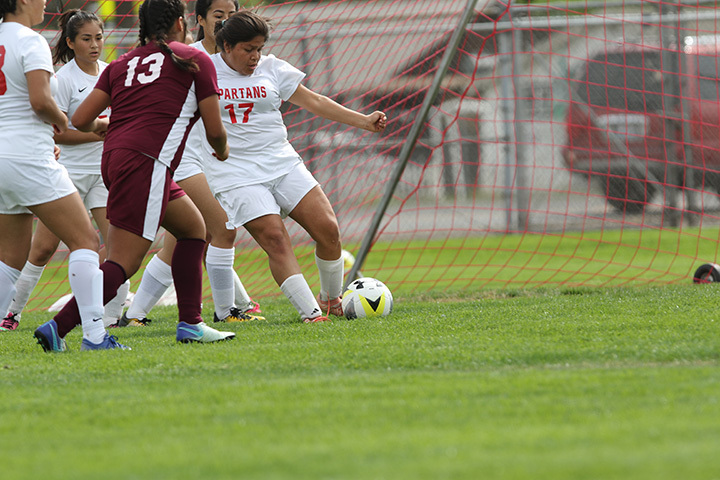 Granger Spartan Soccer lost 2-0 to Naches Valley at home on Thursday, September 20th. Granger Girls Soccer lost 8-1 at Highland on Tuesday, September 18th. Mireya Carrasco scored the Spartans goal with Julie Salgado assisting. First Half: Gaby Gutierrez (H) (Jackie Naranjo) 17:00, Gaby Gutierrez (H) (Ivette Ramos) 27:00, Jasmine Silva (H) (Michelle Soto) 32:00, Gaby Gutierrez (H) (Jasmine Silva) 35:00, Gaby Gutierrez (H) (Jasmine Silva) 38:00, Gaby Gutierrez (H) (Jackie Naranjo) 39:00. Second Half: Mireya Carrasco (G) (Julie Salgado) 48:00, Gaby Gutierrez (H) (Ivette Ramos) 65:00, Michelle Soto (H) (Litzy Gabino) 70:00. Saves Mariana Ramos (H) 3, Priscilla Ramos (G) 10. Granger Girls’ Soccer defeated Goldendale at home 4-0 on Thursday, September 13th. Julie Salgado scored 2 goals, Brenda Cuevas scored 1 and had an assist, Yaneli Torres scored one, and Naydin Franco had an assist to lead the Spartans. 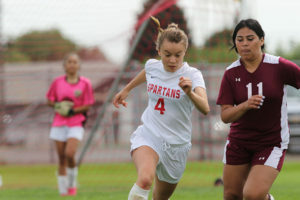 Spartan Girls’ Soccer won 3-2 at Zillah on Tuesday, September 11th. Julie Salgado had the hat trick for Granger, Xochitl Chavez and Yaneli Torres had assists and Priscilla Ramos had 6 saves. First Half: Julie Salgado, 19:00 (G); Makilie Hernandes, 24:00 (Z). Granger Girls Soccer lost 5-2 at Ki-Be on Thursday, September 6th. 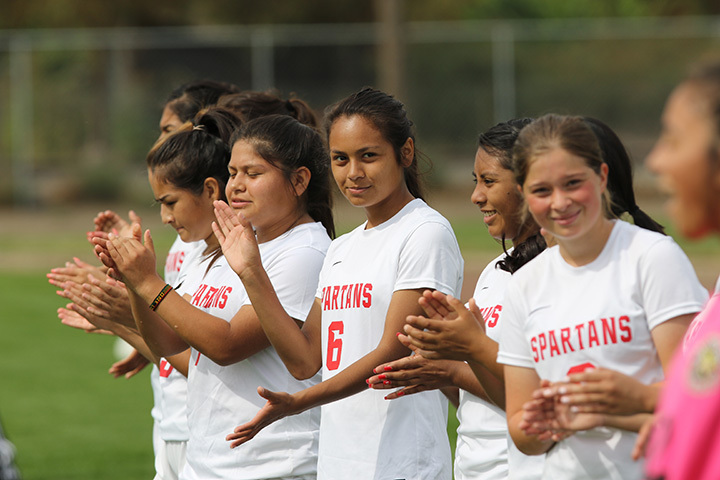 Mireya Carrasco and Xochitl Chavez both scored and Julie Salgado and Mireya Carrasco had assists for the Spartans.